Dr. Ing. Jacco Briedé first took an education as a technician, with a (bio)chemical specialization, at the technical school in Utrecht. During his traineeship at KWR Watercycle Research Institute he developed methods to analyze pesticides and their metabolites in drinking-, ground-, and surfacewater. Thereafter he studied Chemistry at the University Utrecht. During this study, he further specialized in the area of (bio)chemistry. For his graduate research-project he studied the mechanisms that are involved in the maintenance of the asymmetric distribution of the phospholipids in the membrane of the erythrocyte (red blood cell). After his graduation he worked two years in the production of flavors and fragrances at Unilever Netherlands/Quest International. 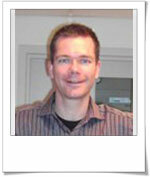 In 1996 he was appointed as a Ph.D.-student at the University Maastricht at the department of Biochemistry. There he focused his interest on blood coagulation under flow conditions in a project that was entitled "Regulation of thrombin formation at the surfaces of adherent platelets". As a Ph.D.-student he attended a training program at the Cardiovascular Research Institute Maastricht (CARIM) including multiple courses concerning the fundamental mechanisms of heart and vascular diseases. In November 2001 he defended his thesis. In May 1 2001 he was appointed as a postdoctoral fellow at the department of health risk analysis and toxicology, followed from April 1 2003 by an appointment as an Assistant Professor at this department. His main research subject concerns the applicability of electron spin resonance (ESR or EPR) spectrometry in the study of free radicals formation and their involvement in environmental health risk assessment and molecular toxicology. He is member of the Benelux EPR group. In addition, the increased application of “omics” technologies drawn his interest and became more integrated in supervised research projects in the field of toxicogenomics. Cellular and mitochondrial free radical formation and the involvement in biological processes e.g. mitochondrial uncoupling and mitochondrial dysfunction caused by e.g. pharmaceuticals and drugs. Applications of toxicogenomics-related applications to unravel mechanisms liver-specific genotoxic and carcinogenic compounds including the development of in vitro alternatives for in vivo toxicology tests. Jacco Briedé is a member of the board of examiners of BioMedical Sciences, which includes the studies bachelor BMS, master BMS and master HFIM. He is a mentor and assessor in the bachelor BMS. He is a co-coordinator of the elective bbs 2004b“cell signaling” in the second year of the bachelor study BMS. Furthermore, he is a staff member, mentor and the internship supervisor of the research master track “Drug development and Neurohealth”, a FHML/FPN shared master track in the research master “Cognitive and Clinical Neuroscience”, where he also coordinates the module “Drug metabolism and safety”. Jacco Briedé supervises students during their Junior and Senior Practical Training/Internship. Also lectures are given and practical work is supervised in the bachelor studies Health Sciences and European Public Health. He is also a trainee supervisor of students from a broad range of (university) studies, including Health Sciences and Medicine.